The Northern snakehead is a non-native, invasive species that someone illegally introduced to the Potomac River. Anglers who catch a snakehead fish could win prizes worth up to $200 in the Maryland Department of Natural Resources' (DNR) second annual snakehead contest. Anyone who removes at least one of the invasive, non-native fish from the Chesapeake Bay's watershed has the chance to walk away with prizes from Bass Pro Shops at Arundel Mills, the Maryland Park Service, the Potomac River Fisheries Commission and the U.S. Fish & Wildlife Service. To enter, an angler should submit catch details and a photo of their dead snakehead online through the DNR Angler's log, a popular social fishing site, at dnr.maryland.gov/fisheries/fishingreport/log.asp. 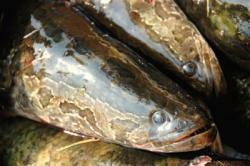 "We do not want snakeheads in our waters," said DNR Inland Fisheries Director Don Cosden. "This initiative is a way to remind anglers that it is important to catch and remove this invasive species of fish." The Northern snakehead is a non-native, invasive species that someone illegally introduced to the Potomac River. Since its introduction, the population has expanded because of the fish's ability to adapt to the ecosystem. Snakeheads now prowl the Potomac River and many of its tributaries from Great Falls to the mouth of the river. Anglers have found the fish as far away as the Rhode and Nanticoke Rivers. As top predators, they rely on other species for food and could negatively impact the ecosystem and other valuable fish populations. "These fish clobber any type of moving bait you throw," said Rodney Hose of Lexington Park, who won the Bass Pro Shops gift card in last year's contest. "When they smash into your lure, be prepared for a fight- especially if they are around some sort of cover." Hose caught his winner along the Occoquan River shoreline in September. Three lucky anglers will win from a random drawing. The prizes include a $200 gift card from Bass Pro Shops, a Maryland State Passport, which provides unlimited day-use entry for up to ten passengers in a vehicle, unlimited boat launching at State Park facilities and a 10 percent discount on State-operated concessions and boat rentals, or a Potomac River Fisheries Commission fishing license. DNR staff will randomly draw the winner on November 30, 2012. The U.S. Fish and Wildlife Service is providing an embroidered "Snakehead Control" ball cap for anglers who report tagged snakeheads through the (800) 448-8322 line. "We don't expect that anglers will eradicate the snakehead population," said Joe Love, DNR Tidal Bass program manager. "We do believe this promotion and inspiration of anglers can help control the snakehead population. The information we gain from the Angler's Log reports are also helpful in assessing the abundance, spread and impact of these feisty fish." DNR reminds anglers that it is illegal to possess a live northern snakehead in Maryland. Additionally, Federal law prohibits the transport of live snakeheads into the U.S. or across State lines. To learn how to identify and kill a snakehead, see the below video for tips and information.